An early image of the White House, home to twenty presidents before Grover Cleveland. The Presidency has always come with very nice housing. Free. By the time a President is elected, he is mature, established in a profession, and at least of middle class means. Some of our early POTUSes had magnificent estates even then – like Washington, Jefferson and Madison. World-traveled John Quincy Adams maintained two homes: one in Washington DC, and the family home in Massachusetts. Professionally rumpled soldier Zachary Taylor had purchased a Louisiana plantation for his retirement. Distinctly middle class presidents like Franklin Pierce, Abraham Lincoln and Andrew Johnson owned their own homes. Even lifelong bachelor James Buchanan had a fine estate in Lancaster, PA. But not so Grover Cleveland. When Grover Cleveland (1837-1908) was elected President in 1884, he was 47 years old and a bachelor. Grover Cleveland had no house of his own until after he became President. As a successful business attorney in Buffalo, NY, as well as an unmarried man, he found it more expedient to maintain a couple of rooms above his law office for his modest housing needs. His meals were “out” – mostly at the plentiful saloons that abounded in industrial Buffalo, where, for the price of a nickel beer, one could get all the sausage one could eat. At 300-lbs., Grover Cleveland could put away a lot of beer and sausage. His need for formal entertaining was nil, since his preference was for card games at the fire house, and periodic fishing and hunting trips. Guy stuff. Thus he had no need nor desire to purchase a house, even though he could easily afford one. In the brief time he spent in public office (two years as Buffalo Mayor and two as NY Governor), he still had no need for a house. And the White House came with the job. 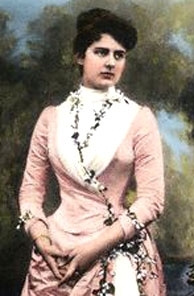 Frances Folsom Cleveland was the youngest of all First Ladies. Only 21 when she married a sitting President. Unbeknownst to just about everyone save those intimately involved, the brand new President was engaged to be married. His intended was a 20-year-old woman he had known even before she was born. Her father had been Cleveland’s law partner and best friend. When he died “Uncle Cleve,” his executor, undertook to provide for his widow and nine year old daughter. This included an education at Wells College. About the time Miss Frances Folsom was old enough to put her hair up and her hems down, “Uncle Cleve’s” interest became less avuncular. The actual courtship was via letter and bouquet; nevertheless, by the time Cleveland was elected, he had already proposed and been accepted. Once graduated, Frances and her mother spent several months abroad, ostensibly purchasing her trousseau. 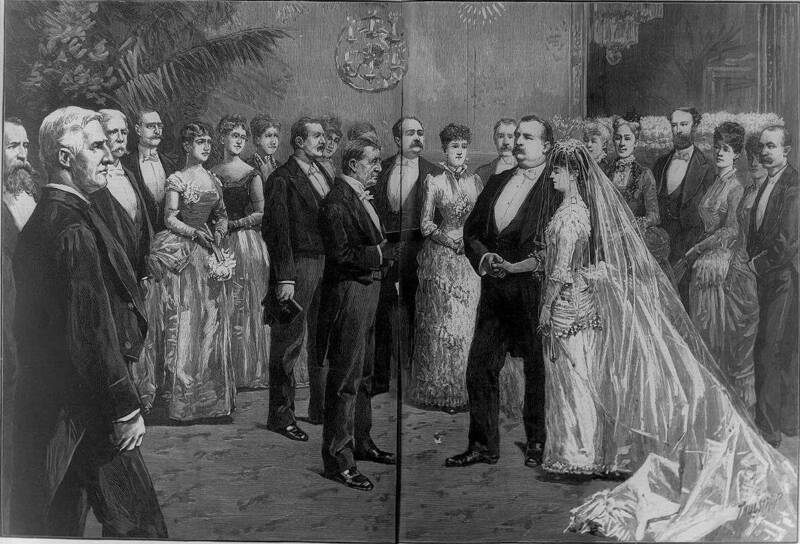 An artistic image of the Cleveland wedding. No actual photography was permitted. Meanwhile every matron in Washington was eager to introduce her widowed or unmarried middle-aged sister/daughter/aunt to the very eligible (so they thought) President. House purchases are public records. Anyone can go to a town clerk and ask for and receive access to information about recent local house sales. Some time in May, 1886, President Grover Cleveland closed on a large house in Georgetown and began making substantial changes to the 20-year-old structure. Why would a lifelong bachelor President with a fine FREE residence at his disposal, purchase a house? Something must be afoot, thought the journalists who always scoured for news. Rumors spread like wildfire, and eventually uncovered the President’s long kept secret. He was about to marry Miss Frances Folsom, who was scheduled to return to the US within a few days. Grover Cleveland loathed the press, believing journalists to be intrusive and utterly disrespectful of anything resembling privacy. This was one of the reasons he chose to purchase a house where he and his bride could live away from the White House fishbowl and the prying eyes of newspaper reporters. 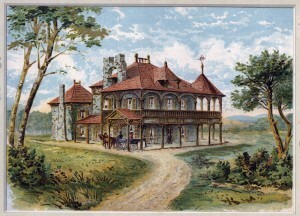 Cleveland’s new property, named Oak Hill, was situated on around 25 acres, far from the road. He immediately authorized a high fence surrounding the property to deter snooping. One intrepid journalist climbed a tall tree, and discovered that he could only see its the red roof. The estate was immediately nicknamed “Red Top,” further annoying the President who consistently referred to it only as Oak Hill. During the next two years, several alterations were made, including tall turrets, the popular Victorian architectural element. Cleveland spared no expense making the house a home, plus whatever furnishings his bride wanted. With more than 20 rooms, including a large ballroom, sufficient dining areas and lush gardens, she had plenty of opportunities to decorate. The Clevelands spent the Washington social season (traditionally mid-fall to mid-spring) living at the White House, and holding the huge numbers of luncheons, teas, receptions, dinners and state occasions expected from the First Family. 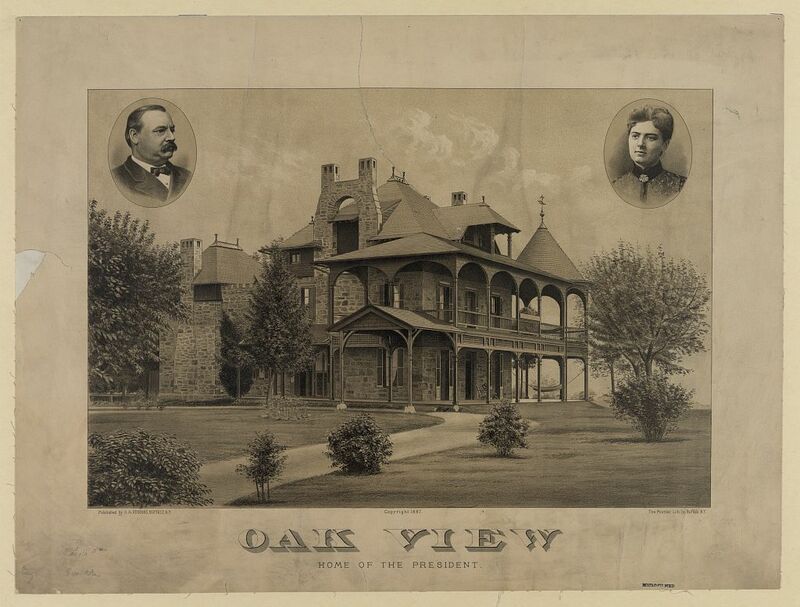 But once the “season” ended, they moved to Red Top/Oak Hill where they could truly be Mr. and Mrs. Grover Cleveland. Grover Cleveland lost his bid for re-election in 1888, so Red Top with all its improvements, was sold in 1890 at a tidy $100,000 profit, according to the Cleveland Park Historical Society. The property was re-sold several times until it was finally demolished in 1927. Today the area is now called Cleveland Park. In 1892 however, Grover Cleveland was elected once again to a non-consecutive second term. By this time, a daughter had been born, with two more to follow. True to form, President Cleveland bought another home-away-from-House, called “Woodley,” where he and his growing family could enjoy at least some modicum of privacy and family life. This entry was posted in A POTUS-FLOTUS Blog, Grover Cleveland and tagged "Red Top", American history, Cleveland estate "Red Top", Cleveland estate "Woodley", Cleveland estate Oak Hill, Feather Schwartz Foster, First Lady Frances Cleveland, First Lady History, Frances Folsom Cleveland, Grover Cleveland, history, James Buchanan, John Quincy Adams, Oak Hill, President Grover Cleeland, Presidential history, Presidential home "Red Top", The White House, US history, White House history, Zachary Taylor. Bookmark the permalink. Interesting insight into the Cleveland family. Clever use of the word “avuncular.” Readers: the backstory is that one source one time (I think it was Degregorio’s book on presidents) referred to Cleveland’s early interest in Francis to be “avuncular” and everybody has copied it since. Avuncular means “parental” by the way.